Uruguayan astronomer Tabaré Gallardo suggested in 2006 that the asteroids Crantor and 2000 SN331 complete their orbits of the Sun in the same time period as Uranus - an orbit of approximately 84 Earth years. Now two researchers at the Complutense University of Madrid (UCM, Spain) have confirmed that in the case of Crantor this is true. 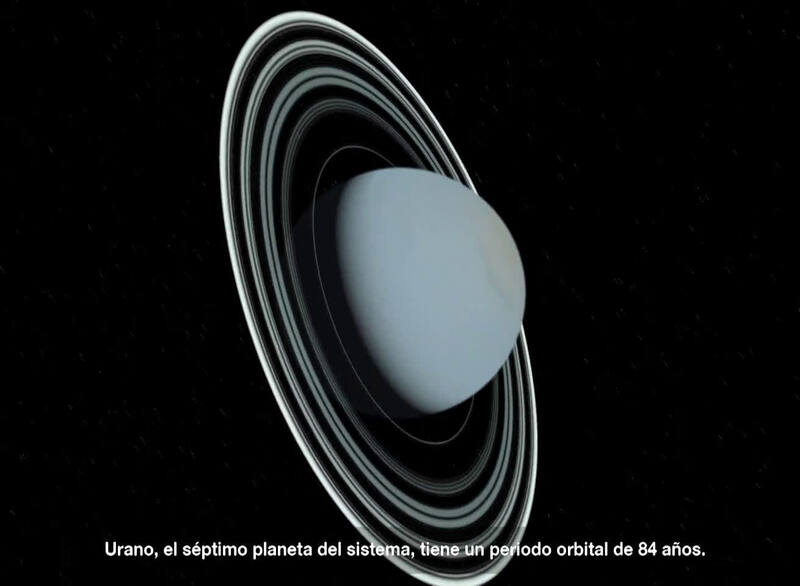 "The simulations we have carried out in the Data Processing Centre of the UCM indicate that 2000 SN331 does not have 1:1 commensurability with Uranus, but Crantor does, which means it orbits the Sun in exactly the same time period as the planet," Carlos de la Fuente Marcos, one of the authors of the study, explains to SINC. In addition, Crantor's orbit has a very similar semi-major axis to that of Uranus, although its eccentricity and inclination vary. The trajectories, figures and animations are published in the journal Astronomy & Astrophysics. "This 70 km-wide asteroid's orbit is controlled by the Sun and Uranus but is unstable due to disturbances from nearby Saturn," states De la Fuente Marcos. The researcher also reveals that they found another object, which has been named 2010 EU65 and moves in a similar orbit to Crantor's, "although much more stable because its trajectory is less eccentric." Similarly, the latest data of a third asteroid, 2011 QF99 - the discovery of which was made public only a few weeks ago - also indicate that its orbit is in line with that of Uranus. According to the Minor Planet Center, the regulating organization for the naming of asteroids and comets, the three objects that "follow" Uranus belong to the group of the Centaurs. These icy planetoids endowed with a mythological name orbit the Sun between Jupiter and Neptune. 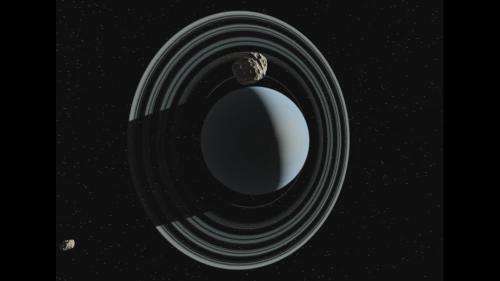 "Crantor, 2010 EU65 and 2011 QF99 are the first bodies to be documented as co-orbiting with Uranus," affirms De la Fuente Marcos, "although with distinct movements and trajectories." From the point of view of an observer rotating along with Uranus, both Crantor and 2010 EU65 have "horseshoe" orbits, since they acquire this form as they move towards and away from the planet. In fact, these two centaurs periodically have close encounters with Uranus. However, 2011 QF99 maintains a more stable, Trojan or "tadpole" orbit, which means that it moves 60 degrees in front of Uranus. This asteroid always maintains a relatively large distance from the planet. The scientists calculate that the orbits of these three objects associated with Uranus could remain stable for a few million years. In astronomical terms this is not very long. With the Data Processing Centre's simulations, the same team has identified three new Mars Trojan asteroids with stable orbits of up to 10,000 million years. More information: Fuente Marcos, C. and Fuenta Marcos, R. Crantor, a short-lived horseshoe companion to Uranus, Astronomy & Astrophysics 551: A114, March 2013. Fuente Marcos, C. and Fuenta Marcos, R. Crantor, Three new stable L5 Mars Trojans, Monthly Notices of the Royal Astronomical Society Letters 432: 31-35, May 2013.
because of the title of the article -- every author needs a friend that specializes in toilet humor to give a thumbs up on headlines. this is just too funny to ignore. The 10-year-old in me is giggling to beat all :D Awesome headline! I've seen dogs that follow Uranus around the room . . . Interesting. So now Uranus is not a planet since it has not "cleared its orbit" per the new IAU definition that excludes Pluto as a planet. I'm being snarky but the IAU definition of a planet needs further work. Seeing that its more semantic than scientific it may be difficult to set a firm human language boundary on nature's wide creative spectrum of non-fusion objects. Ya have it just a tad wrong, it's "cleared the neighborhood around it's orbit". That wording wasn't meant to imply "Cleared everything out of it's orbit". It means it is the major body of it's orbit and dominates other objects in it's neighborhood. Jupiter shares the same phenomena with the Trojan bodies. Pluto is still relentlessly bumping into things. The things in Jupiter's and Saturn's orbits are pretty much stable, not so with Pluto's orbital neighbors. "Crantor, 2010 EU65 and 2011 QF99 are the first bodies to be documented as co-orbiting with Uranus,"
True. VendiTardE is not co-orbiting Uranus. He is circling the drain.